Walker's real estate empire collapsed in early 1985 but Can-Am somehow continued even though the only two competitive cars from 1984 were now gone as well. The saving grace for Can-Am in 1983 and 1984 had been that there was nowhere else to race a Can-Am car but even that had changed with the growth of the Thundersports series in England. That had mopped up the March 817s and 827, several Lola T530s and even a VDS and a Frissbee. The Galles Frissbees stayed in the US however and these, now on the hands of the unknown Rick Miaskiewicz, were sufficient to win the 1985 title. He led the first round at Mosport, finished second at race 2 and then won the next three. Horst Kroll continued to race in the series and with all the other competition having moved on, he was able to win his first Can-Am race - at Mosport Park after Miaskiewicz had crashed. 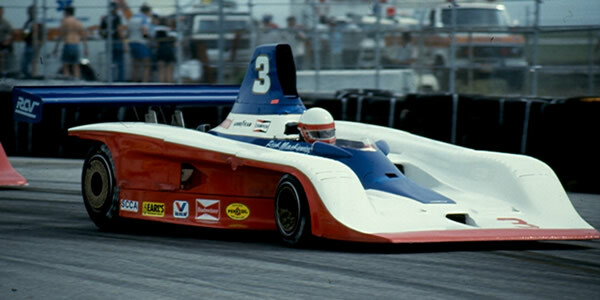 The other race winners were veteran Lou Sell, who drove a converted March 832-BMW F2 car to victory in the St Petersberg race, the first ever Can-Am win by a 2-litre car; and Bruce MacInnes, instructor at the local Skip Barber Racing School, who won at Lime Rock in an old Lola T333. The points table shown here is from On Track 17 Feb 1986 p69.